Moss rock creates a forest ambiance and provide a sense of age to even a new garden. A group of mossy rocks in a landscape gives the impression that they've always been there. Moss rocks camouflage power cords, irrigation channels, pipes, standing meters, and other unsightly yard features. Add moss rocks around a pool or fountain to bring nature into your yard. Moss rocks in flower beds deter digging by dogs, cats and other animals. Create your own forest setting at home by growing moss on rocks with a few basic supplies. Select shady areas for the moss rocks for best results. Place real rocks throughout the landscape. Place the rocks first, before adding moss. Make irregular arrangements of stones heaped together and lying next to each other, the way they appear in nature. This effect works well near fountains, pools and under trees. Place boulders and large rocks toward the back of the arrangements with smaller rocks tumbled in front, as though they fell there. Arrange smaller moss rocks as edging for shady flower beds or walkways. Line the rocks up side by side so they touch, placing them as a border for the flower bed or walkway. Using small moss rocks as edging also helps to reduce erosion. Place moss boulders and large moss rocks at intervals in flower beds and other planting areas. Space them irregularly, with some forward and some toward the back, to create a natural effect. Create your own moss rocks with a mixture to help the moss grow. The Landscape Design Site recommends mixing porcelain clay with water, fish emulsion and live moss. Measure 3 cups of water into the bucket. Mix a large fistful of clay into the water and stir it in well. Stir in 1 cup fish emulsion. Tear 1 cup of live moss apart into small strands. Stir the moss into the mixture. Apply the moss mixture with a paintbrush to real rocks and stones. Brush it on rocks used for landscaping accents, rock gardens and edging. Place the rocks where you want them before painting them with the moss mixture. Create a rock garden on a hillside to improve the area and reduce erosion. Bury 25 to 30 percent of each boulder or large rock to reduce risk of rock slide and give them the appearance of being part of the natural landscape. Paint fountains or bird bath bases with moss, if desired. 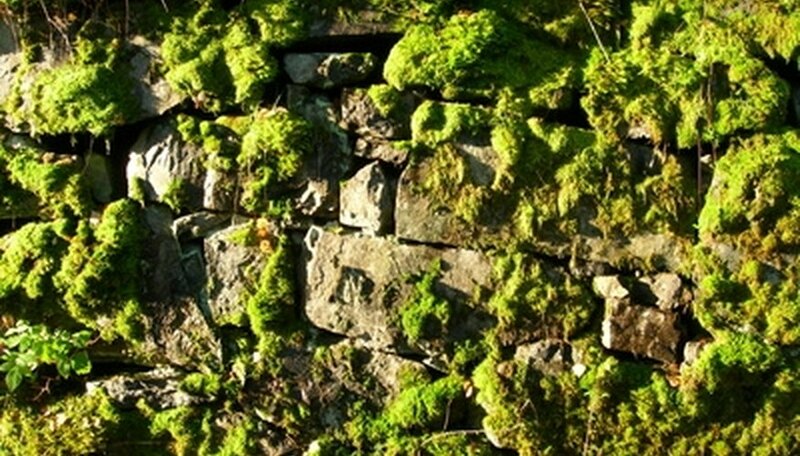 Moss will grow on natural rock or cement. Keep large boulders off tree roots and don't pile moss rocks next to tree trunks or against the siding of the house or other buildings to avoid risk of rot. Moisture won't dry out as well behind and under rocks. Don't pile moss rocks against a fence for the same reason.